It is certainly a #firstworldproblem to endure sub-par frame rates while gaming… but after ~2.5 years with my trusty GeForce GTX 650, I decided to upgrade to a 970. It arrived and I swapped out cards and went to do a FPS check. TL;DR – holy moly my frame rates have skyrocketed! I checked and get the same 62-63 FPS I got before. This tells me GW2 is coded to limit the FPS. In any case, that’s awesome the game runs so well on earlier gen cards. No new screenshot since it’s the same. If you can’t tell, I’m pretty excited about my new graphics card. Great upgrade, well worth it. EDIT: add in how to display the frame rates in these games. On the other hand, I was recently subbed to 3 MMO’s (EVE, WoW, WS) for ~$42/quarter for each. I have since let EVE drop and will not renew WoW or WS (I have roughly 6 weeks left in each already paid for). It is convenient to think of it as ~$42/month for 3 games. Granted, most people probably aren’t juggling 3 subs at the same time – and neither am I anymore since there just aren’t enough hours in the week to play those games much less the “free” ones! But by that metric, I bought ~4.5 months worth of 3 sub games. As I mentioned, the sub free isn’t a deal breaker, MMOs are pretty good entertainment value for the money. The question is more: what else can I do with that money? The nearest competitor is other computer games, for example ones I can buy on Steam or GoG. Well, if I save up and buy during sale – I notice that GoG is also having a sale which overlapped the Steam sale period – I can get a heck of a lot of games for an average of $10 each. If I were even more disciplined, I could have scooped up games selling for super cheap, say less than $5, and lowered my average cost per game. With this influx of titles, I am resolved to work down my ridiculously large Steam backlog. Much like Syp and Wilhelm, I need to step away from the purchase button and play the game I own. So I want to accumulate a “reasonable” amount of playtime in these new games, plus go through my library and play the ones I already have, unless I can’t get into a game at all. Maybe my best plan is to disconnect my credit card from Steam, which would throw a small barrier into each purchase – typing my credit card number rather than just the CCV code. On the MMO front, a friend bought The Secret World during the Steam sale. I’m excited since this means I might have someone to duo with on occasion. I have another who is a huge Elder Scrolls fan, but unfortunately she is a dedicated console gamer, and ESO is keeping the PC, XB1, and PS4 populations separated. And if it isn’t apparent, over the past few weeks I’ve decided to cull the MMOs I’m playing. 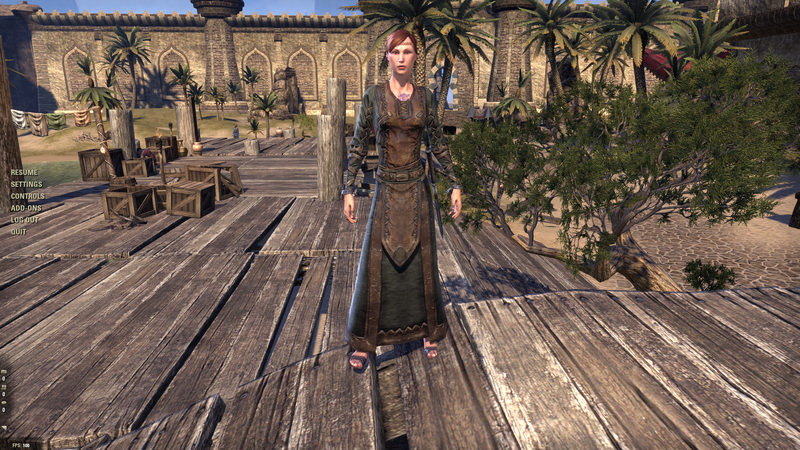 TSW and ESO make the list for me, because I enjoy the storyline and questing in both games, and they are also fairly solo-friendly. Actually, all MMOs these days are, it is more that I almost don’t want to end-game raid or anything like that. I had a blast in WoW, but I can’t dedicate evening time slots to doing it – flexibility above all, and PUGging/LFRing end game stuff isn’t enough to keep me subbed. Instead I’ll buy miscellaneous doodads from the in-game stores. I’ll probably dabble in LoTRO and GW2 as well, as a low priority. I can have fun on a few hours every other week or so. After finding out how lousy the framerate is for WildStar, I dug around and displayed framerates in the various games I play. All these games are at 2560×1440 with mostly default quality settings. I generally don’t go through and tweak anything, letting the game default or decide for me. But, I may have clicked a slider a position or two, but I definitely didn’t crank up TSW or WS to trash the frame rate, nor did I degrade the appearance of WoW, LoTRO, GW2, or EVE to crank the frame rate. No surprise with WoW leading at 100 fps on my system. LoTRO is impressive, given how old the game is and how great the game looks. GW2 isn’t too bad, and neither is EVE. But TSW and WS are kinda dragging. TSW is decent and I don’t really notice it is at 30 fps when I play. But I do notice the ~18 fps I get in WS and I’m sure that isn’t hard to believe. So I can look for tweaks to improve the framerate of WS or splurge on a newer fancier graphics card. I suppose I should try in-game stuff first, since that won’t cost me anything. 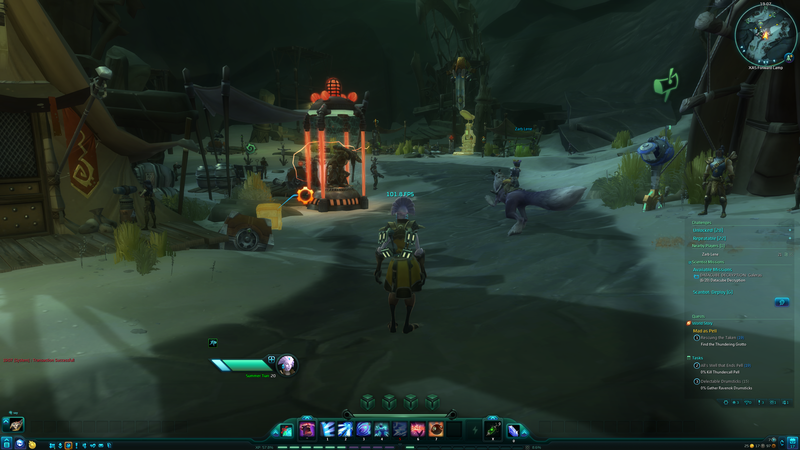 EDIT: after fiddling for a while, I found the simplest way to bump up the FPS in WildStar is to play at a lower resolution. In 1920×1200, I get about 38-40 FPS. I’d rather do that than degrade every other setting to eke out a few FPS here and there. This blog is generally a summary of in-game activities, because that’s what I enjoy reading other blogs for (and writing about). It’s interesting to read what others think about various issues, but mostly I leave the State of the Genre (™) musings and other deep thoughts on the nature of MMO content to others. There have been some interesting posts recently, from Syncaine, Jewel, and some else I cannot find in my browser history! Note: I found the gist of it in 2 other places so maybe I’m just shuffling that together in my mind. I’ll get to that. TL;DR – my 2nd comment is a concise summary of my actual point: I think the F2P funding model will be even more prevalent in the future, for various reasons. Syncaine ranted about the State of the Genre 2015, which is a great post in which he splits up the genre into 4 time slots: birth, WoW/EVE, clones, F2P. In case you somehow missed it from all previous posts, Syncaine is not enamored with the F2P revenue model; a game moving to it is a failure. Except of course, for the handful of “successful” games, which are defined as “subscription games with a large population of players”. By this definition, all F2P games are failures because they cannot also be “subscription games with a large population of players.” And the Asian ones which have large successful long running examples. But they don’t count either for reasons. There are of course exceptions to the exceptions – by some measure, various players will tell you EVE is really subscription optional because real players PLEX all their accounts through their awesome spaceship mining and market ninja skills. When you subscribe to EVE, you are really merely a temporarily embarrassed market guru, or just too lazy to mine Mercoxit for the big ISK payoff. GW2 is also a notable failure, because ANet is forced to release an expansion 3 years after launch, because “they” never mentioned that in the original vision. O RLY? Now I was there at the start of GW2, largely because I was a rabid fan of GW, and I don’t recall anybody associated with ArenaNet ever saying “we will never charge for expansions”. I mean, they did exactly that in the previous game, for Cantha, Elona, and EoTN. I’m pretty sure they wouldn’t pre-emptively cut their options off but hey, maybe my memory is shot so some sort of source link would be nice, if it exists. “Buy the box, play forever” doesn’t guarantee access to new content – going off the previous example by the same studio, if I never bought Factions, I never get to make a Ritualist or Assassin. But I still get to roam freely and unrestricted in the Prophecies campaign. But, WoW is NOT a failure for charging for expansions – after all, Blizzard probably never said they would never release an expansion! See how that works?? ArenaNet also changed their game delivery, since I also don’t recall promising biweekly content updates at the start. Those updates surely cost money to produce, so perhaps the expansion will fund future updates in a more reliable fashion. But this is a catch-22 since Syncaine could claim that as a sign of failure as well. It’s beautiful logic really – charging for an expansion is failure, cash shops are failure (except for WoW and EVE which have an approved exemption), developing new content and wanting to charge for it is also failure; unless it is all done via subscription in which it is the correct way to succeed. There is some disagreement over revenue models, and when I point that out I am accused of going “full retard” (i.e. I disagree or point out some inconsistencies in his definitions). Yes, B2P is terrible… except that’s how games were sold for I dunno, 30+ years? And are still sold right now? Yeah, clearly there is no possibility of that working, it was all just an illusion. I don’t remember buying “Wizardry: Providing Grounds of the Mad Overlord” for a monthly fee but maybe I just can’t recall as well as Syncaine can. Anyway, music to my ears, from the guy that drops unsourced guesswork into his posts, which all clearly demonstrate GW2 failed. After all, it cost 100x as much as EVE, isn’t profitable, and is apparently in death throes. Another sure sign of GW2 failure is the cash shop – but that one must have been implemented on opposite day by ArenaNet because the same cash shop functionality in WoW and EVE aren’t ever mentioned as steps towards their imminent failure. It is truly difficult to follow the consistent logic and requirements of the Syncaine-approved stamp of MMO success. Basically it seems to boil down to a certain forgiveness a sins, as if success (i.e. subscription) grants a retroactive stamp of “correct” on all decisions. If Turbine announces a $50 hobby horse, but never actually puts it in the game, that is an example of a screwup. But CCP can put a $60 monocle up for actual sale, and that is viewed as an opportunity to show how CCP listens to feedback when they remove it. Same mistake, actually bigger since the hobby horse was never actually for sale, vastly different response. Same thing with WoW’s space pony for $25. Basically, a money grubbing game that charges a subscription – ah that’s OK. A money grubbing game that partly exists on a cash store – worst thing ever. Anyway, under the ever-shifting definition of “successful MMO” landed some interesting reading, from Forbes and Gamasutra. They basically say that for various reasons, things have changed since 2009 (the year Syncaine appears to be stuck ranting in) and perhaps in current times, F2P is actually part of the business plan. Yes, part of the plan all along. Basically like how airplanes and car makers charge more for better seats and models, MMO studios charge a subscription to recoup a portion of their initial investment, then switch to F2P for steady-state activity. Price discrimination at its finest. But doesn’t that line up with Syncaine’s disdain for F2P – the studio already planned failmode from the start? How can that be?? Well… businesses don’t actually care how Syncaine buckets their product, they are more interested in revenue, since that’s what actually pays the bills, not the thumbs up of approval from various bloggers. And along those lines was a post that caught my eye, about how much revenue games are pulling in. It summarizes other information from Superdata Research “digital good measurement” which are all interesting. However the most interesting thing is according to Superdata, SW:TOR and LoTRO are raking in over $100 million a year (in revenue, so not sure how much is left after paying the bills), which I would think is not too shabby. These games might also have expenses higher than that, but I would think a moderately well run gaming business can survive on $100 million a year in sales. It isn’t like they depend on wildly fluctuating prices on the world commodity market. Somehow regular non-MMO games get by without subscription revenue, with occasional releases every few years, so surely some MBA can figure out how to keep the lights on. If player’s wallet voting is what matters, as Syncaine says in the comments of his post, then.. oops wait a minute, some of these F2P games are higher revenue some subscription games? That is unpossible! They must be subscription games in disguise playing an inscrutable long game. Or they didn’t get the memo that the top revenue spots are reserved for subscription games. I’ve rambled a lot so far, but there is more – yes there is! J3w3l at Healing the Masses wrote a funny post which highlights that not one, but TWO of those mobile F2P games advertised during the Superbowl. Yes, the most costliest ad slots in all of TV, USD $4.5 million for 30 seconds (this year), and Clash of Clans and Game of War felt it was worth the money. Why would they do that and what does it mean? I was thinking about that and realized it was the final piece that makes everything fit together. I think F2P will be the dominant model for MMOs going forward. Despite what Syncaine thinks, what matters to businesses is paying their bills and there is ample proof that enough money comes in via this model. For example, the app market in general (more on that coming up). Yes there are failures, just like subscription MMOs folded and disappeared before an F2P conversion was even imagined. Unless there is some secret charity funding MMOs, enough are F2P and continuing to run despite being left for dead years ago, that they can’t all be attributed to isolated situations. But a larger point is that an entire generation of gamers is being brought up on that model – the one with low cost/no cost initial purchase, expansion or in-game/in-app purchases that is basically centered around the F2P model, and perhaps more casual gameplay (i.e. not playing the game as effectively part-time job) too. This model gained primacy through the release of the iPhone and its Appstore in 2007. By 2009 is was clearly a success and in 2011, which Syncaine lists as the split between cloning and f2p-ing, finance-types were busy figuring out monetization models for their products. And all of them basically said that F2P was a model that worked from mobile to desktop, shooters to strategy, single and multi player; so bake that in from the get-go. Because if we have a viable business from F2P revenue, then a subscription period that lasts longer then planned is extra gravy on top of the whipped cream. So I can see a future where the vast majority of the customer base has grown up playing CoC – ironically Syncaine enjoys a match now and then – and other similar games, expecting a low-cost buy in, no subscription, and various tchotchkes for sale in game, to where they cannot imagine paying a subscription because that is a relic of a bygone era. I think it is interesting that WoW and EVE are already 10+ years old, and Blizzard and Square Enix wrote games for decades before entering the MMO scene, with great success. In some ways, they are already relics of an earlier age. I broke down and bought Divinity: Original Sin, without waiting for a Steam sale (the horror!!) and so far, I’m enjoying it. Computer RPGs and I go way back, starting with Wizardry: Proving Grounds of the Mad Overlord, on an Apple 2 back in… 1982 I guess. I know some of these straddle the line of FPS and RPG, but I’d classify Deus Ex and Mass Effect more on the RPG side, as opposed to Borderlands/Borderlands 2 and the Bioshock series, which are more on the FPS side. Also, I didn’t include Torchlight or Torchlight 2 since they fall more and the action-clicky side for me. I’m arbitrarily deciding that the game needs a certain amount of complexity of char growth (skills, talent trees, whatever) in order to make my already long list, I don’t mean to throw these great games under the bus. I’ve purchased Baldur’s Gate/Baldur’s Gate 2 at GOG and Steam. What can I say; the GOG purchase was on some crazy discount, and the Steam purchase was probably through a sale (I can’t remember exactly) and the fact is the Steam purchase is really nice since those versions have modern resolutions. These lists could grow a bit more depending on whether “stealth action open world” games belong. If so, add in Thief, Thief 2, Thief Gold, System Shock 2, the Assassin’s Creed series… heck perhaps the newest Tomb Raider qualifies (and I have this game as well). Basically, I really enjoy RPGs. Age of Wushu and Dungeon & Dragons Online get installed and uninstalled depending, but they are both currently not installed. The point of all this is that I’ve come to realize that what I like about CRPGs – storyline, character development, self-paced advancement, etc. has bled over into how I play an MMO. In a single player game, I proceed carefully, build up a certain amount of character/party strength before tackling a tougher challenge. I use quicksaves so that losses/defeats set me back a little but not too much. So when I play an MMO, I also proceed slowly and carefully, minimize risk, avoid PvP, etc. and wind up playing them mostly solo. I group, but I think that wouldn’t amount to more than 20% of time. In many ways, the original Guild Wars was perfect for me because I could play it like an RPG; it featured henchmen and heroes so I could direct my group just like I would in a single-player game. Yet if I wanted to group I could, or jump into Alliance Battle without loss of items, etc. 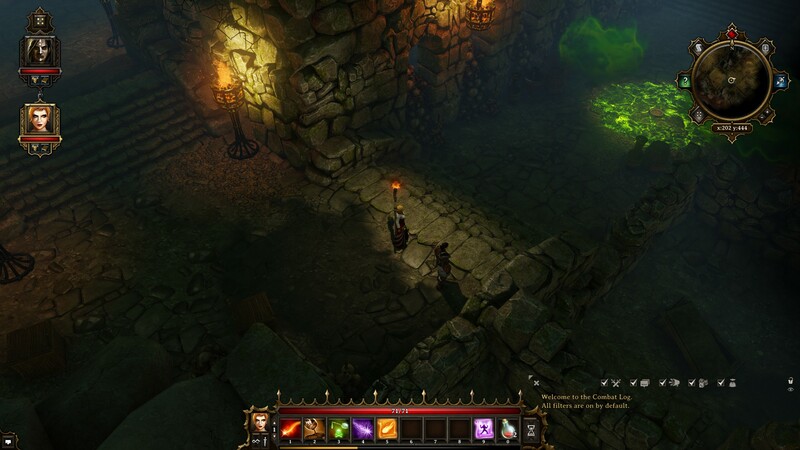 One super feature of the CRPG is being able to pause/save and walk away, whereas an MMO is a bit more demanding – ideally I could block a chunk of time off and not get interrupted for that duration, but that is tough for me to arrange. Over the Thanksgiving holiday, I decided to try out a few miscellaneous games in my Steam Library. It didn’t go so well. My favorite Civ was Civ 2, but that was also the one I played the most. I played a bit just to check, and it seems to run fine. This game ran just fine on Windows 8. Good news since I’m a fan of Tower Defense games and this is a pretty good one. I just peeked in, and this also runs fine. Lots of people talked about how this game is really good, so I wanted to check it out. Unfortunately, it is unplayable for me. Not sure if that is a Windows 8 thing or not. The problem is that the mouse movement is terribly slow and very erratic. I googled around and see many others reporting this problem, which apparently has to do with mouse drivers. Nothing I tried fixed it. I do have a backup plan: see if this game plays better on my Mac. Has the same problem as FTL does: unusable mouse. A quick google shows this happens to others, and the general advice is “update your video drivers”. Well that’s interesting, my OS is even newer than the most recent WHQL drivers on the nVidia site. But what the heck, I downloaded and tried to install the GeForce 306.97 drivers. And that didn’t work! 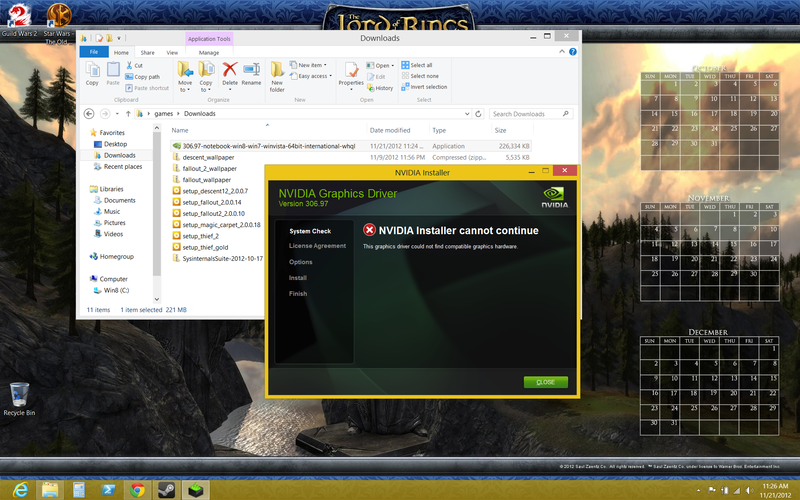 Yes, the nVidia drivers failed to find compatible graphics hardware. That’s funny, except it really is annoying as heck. You can see that I’m installing the notebook, Windows 8, 64 bit drivers – the name of the freaking binary – yet it can’t find my video card. Or more likely, the detection is messed up. Argh, video drivers, the bane of PC gaming. A favorite puzzler of mine. Glad to see if runs fine on Windows 8. I bought this for my iPhone, played it a little and really liked the music. It was part of an Indie Humble Bundle I bought, so I get it through Steam as well. Unfortunately, it doesn’t run properly – it shows the main loading page (“record” circle and 3 small triangles) but nothing else. I had to kill the game via Task Manager, and I noticed it was a 32-bit executable. Maybe it isn’t handling a 64-bit OS and/or Windows 8 well. Same backup plan as FTL – see if it works better on my Mac. This game runs fine. I’ve been playing a little bit since it went F2P and plan on a post later to give my impressions. Overall, most games run fine on Windows 8. The ones that gave the problems were the indie games, but I have a bunch of those due to Humble Bundle purchases, plus the occasional recommendation I catch from other blogs. At least I can retry FTL, HOARD, DEFCON, Superbrothers over on my Mac. The one game I did not get around to trying was XCOM: Enemy Unknown. That’s mostly because I didn’t have a good time block available and I knew I’d want to play a few hours. I’m sure that over the upcoming weeks I’ll find some time! The most annoying thing was the nVidia driver problem, the fact that the supposedly correct package, straight from nVidia, wouldn’t even install. Grrrr. That is my hope for playing GW2 again (I’m still hitting the video timeout issues that plagued me before under Windows 7. 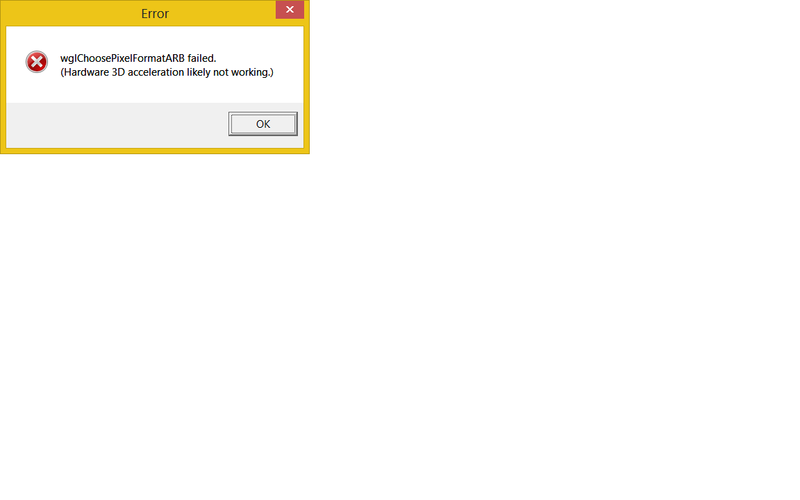 It isn’t worse or better under Windows 8 thus pointing to video drivers at fault). I popped over to my Mac and tried out the games that failed to run properly on Windows 8. Superbrothers – launches and runs fine. I’m so glad the soundtrack came with the Humble Bundle purchase! Glad that my Mac is able to play the games that don’t work on Windows 8! I’m considering a Mac upgrade soon. 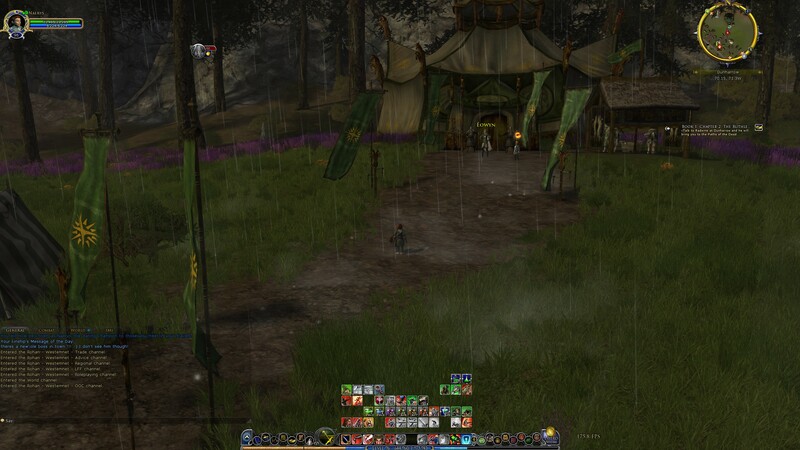 If that does happen, I’ll be able to try the LoTRO and GW2 Mac clients! That could also be my ultimate solution to my GW2 problems.